Bottlenose dolphins in the northern Gulf of Mexico were hit by a triple whammy of events, leading to an unusually high death rate in early 2011, a paper published in PLoS ONE suggests. 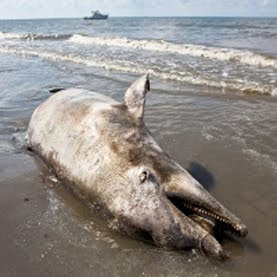 Between January and April 2011, 186 bottlenose dolphins (Tursiops truncatus) washed ashore in the northern Gulf of Mexico. Of these, 86 were near-term or newborn, nearly double the historical average. Dolphin deaths are being monitored by an ongoing Unusual Mortality Event (UME) survey, which began in response to high numbers of adult dolphins dying during a period of sustained cold weather in early 2010. The PLoS ONE study suggests that the cold weather was the first of three factors that weakened the dolphin population and contributed to the high death rate. The second was the Deepwater Horizon oil spill that followed in April. And the third was large volumes of cold fresh water from melting snow entering Mobile Bay — an inlet in the Gulf of Mexico — in 2011. Dolphins naturally encounter seasonal temperature and freshwater fluctuations, says lead author Ruth Carmichael, a marine scientist at Dauphin Island Sea Lab in Alabama, and neither factor alone would necessarily cause strandings or death. But the cold freshwater pulses may have been the proverbial straw that broke the camel’s back, if the dolphin population was already weakened due to depleted food resources caused by preceding events, such as oil in the northern Gulf food chain, or bacterial infection. Between June 2010 and January 2012, 12 of the 51 stranded dolphins tested for Brucella bacteria gave positive results, according to Teri Rowles, coordinator of the National Oceanic and Atmospheric Administration (NOAA) Marine Mammal Health and Stranding Response Program in Silver Spring, Maryland. Brucella, which is present in some healthy animals, can cause pneumonia, encephalitis, skin and bone infections, and abortion in dolphins. “Studies show that dolphins were in poor condition after Deepwater Horizon and some particularly cold winters, and we know from theNOAA analysis that some had Brucella,” says Carmichael. “For animals already stressed and in poor condition, this freight train of cold fresh water could certainly have affected the timing of mortality.” The cold water pulsed into Mobile Bay during the spring birthing period, and the greatest number of newborn strandings were found close to this area. Since dolphins have a gestation period of 12 months, some of the stranded newborns would have been conceived during the oil spill, which could have affected their ability to survive. “It’s a common fact that animals in good shape nutritionally are much more able to withstand change and stress,” says marine biologist Moby Solangi, executive director of the Institute for Marine Mammal Studies in Gulfport, Mississippi. “With multiple environmental challenges, we may not be able to say it was one thing or another. We do know that dolphins in the northern Gulf have been subjected to a number of environmental challenges in the past few years, and we do know that each one of those challenges will have affected their ability to deal with the others.” As is often the case with strandings, few of the dolphins were recovered in good enough condition to determine the cause of death, Rowles says. Nor do scientists have full data on the causes of death from those that have been analyzed. The UME survey is still ongoing, and final data and analysis are typically not available until 18 months after an event. Carmichael hopes that the study will encourage scientists to consider the physical and chemical environments in which events such as strandings happen, as these could affect the way species respond to stresses.